Steel construction is progressing on schedule for a 21.5MW waste wood biomass plant at Ince, near Ellesmere Port in Cheshire. 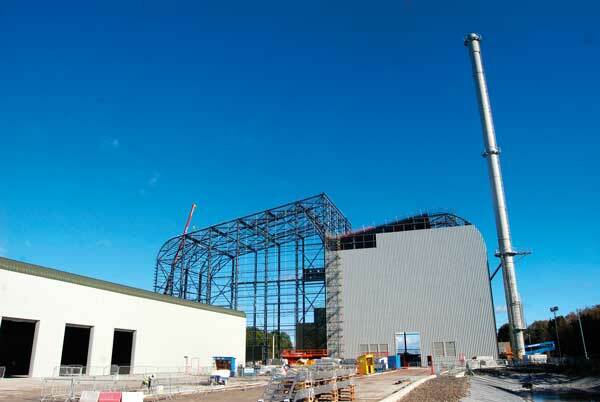 Contained within a large 43m-high steel braced structure, the £100M biomass plant will harness ‘Advanced Gasification Technology’ to process up to 170,000t per year of recovered waste wood, enough to power around 40,000 homes per year. All of the fuel will be sourced from the local economy and a timber processing plant is also being built on a nearby site in order to safeguard supply. MBV has in turn engaged Ward & Burke on a design and build contract to undertake the civils works on the site. As well as extensive groundworks this programme also includes the construction of the project’s large steel-framed structures; including the main process building and a portal-framed fuel reception building. EvadX is fabricating, supplying and erecting 1,000t of steel for the project.